Gamma Crucis (also referred to as Gacrux) is the third-brightest star in the Southern Cross. Unlike its blue-white neighbors in the constellation, Gacrux is a bright red giant. Gacrux is also considered the nearest red giant to Earth, at a distance of roughly 88 light years. It's possible that the star could be variable because it is evolving, Darling added. "It may already be fusing helium in its core; if so it is in the process of becoming a second-ascent giant, brightening into the realm of the giant stars for the second time – a speculation reinforced by its variability," he said. Unlike many navigational stars of the past, Gacrux's name comes simply from combining the two Greek words that make up its name, pointed out Jim Kaler, University of Illinois emeritus professor of astronomy. "In our 'western' star lore, the stars with proper names come from the set that could be seen from the lands of the ancient Middle East and Arabia, and do not include those of the far Southern Hemisphere, which is largely invisible below the horizon from northern lands," he wrote. "Yet those who needed the stars to find their way, the old navigators, also needed quick names for some of the stars and just made them up. "Gacrux" is a prime example of such a star." 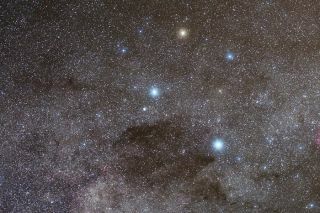 Kaler said the star's location in the Southern Hemisphere, where historically there have not been a lot of telescopes, means it is probably less known than it should be. The star is rare among bright-eye stars in that it is a red giant, he said. Most bright stars in Earth's sky tend to be white, blue or (at times) orange. "For a star of its brilliance, however, it has not received much individual attention, probably again because it is not observable throughout much of the world where we find most of the telescopes. And a pity too, as it is rather unusual among naked-eye stars," he said. There is a star that is about two minutes of arc from Gacrux, but it's not a companion; both Kaler and Darling said this is only a line-of-sight coincidence from Earth. Astronomers, however, are considering that Gacrux could have a white dwarf that is nearby, but wouldn't be visible with technology we currently have. Scientists are also trying to figure out what evolutionary stage Gacrux is at. Kaler said it's possible the star could one day move to a "pulsating variable" similar to the star Mira, in the constellation Cetus (the Whale). "With a mass perhaps three times solar or less, it may well have given up not just hydrogen fusion in its core (which it must do to become a giant in the first place), but may also have gone through its core helium-fusion stage," Kaler wrote. At Gacrux's current size, if it was placed where the sun is now it would reach more than midway through the 93-million-mile (150-million-kilometer) distance to Earth, or half an astronomical unit. The star would also blow strong winds throughout our solar system, as it does right now in its own area.